It was not so long when I was experiencing a strained lower back muscle and so I decided to give patches a try. I had never used patches before; I was using creams and sticks so I gave Icy Hot Medicated Patch a try. This patch contains an ointment on one side. like this, I think creams and sticks are much better. I also experienced that this patch does not relieve the symptoms fast; I took me about an hour to notice some relief. Another bad thing I experienced with using this patch is that whenever I apply it on my body, I normally feel heat on that part where I have applied it. This heat normally lasts for some time before it goes away and I hate this so much. Also I hate that whenever this patches gets in contact with clothes, it curls up and therefore becomes loose. This therefore does not allow this patch to stay in one place and do the job it’s supposed to do effectively. I also noticed that body movements make this patch to loosen up and curl too; I do not like this at all. because it has no bad odor. Another positive I noticed with this patch is that it has never caused any major side effects on my body, I think Icy Hot Medicated Patch has no side effects expect the heating sensation that it causes on my body. I can use it whenever need arises. To me I think these patches are not so expensive because each pack costs about 17,500 UGX, this comes to about 7 USD. I normally buy icy hot medicated patches from the pharmacies and online drug shops and I always find the prices friendly. 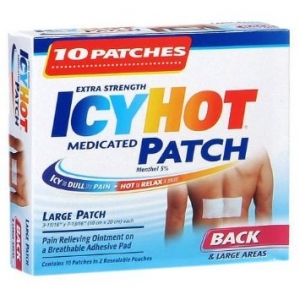 I recommend these patches to anybody suffering from simple backaches plus other minor pains but for only temporally relief, I think these patches are no quite effective for stronger pains.